The Mystery of the Clockwork Sparrow by Katherine Woodfine is a splendid period adventure, set in London not long before the First World War. Sophie Taylor is facing a new beginning. Orphaned and impoverished, she’s about to start her new job at Simpson’s, the brand-new luxury department store that’s opening in Piccadilly. (Simpson’s is a fictitious store, but not dissimilar to Selfridge’s, with a rich enigmatic American founder.) The other shop girls don’t seem to like her very much – but that’s the least of her problems. In no time at all, there’s a robbery at the store, and a variety of treasures – including the famous Clockwork Sparrow of the title – are stolen, an employee is shot, and Sophie is thrust right into the thick of the mystery. Billy is a young porter at Simpson’s whose head is stuck in the detective stories of his Boys of Empire magazine. Soon he’s drawn into Sophie’s plight, along with Lily, aspiring actress and one of the “Captain’s Girls” (fashion models who put on daily shows in the store), and Joe, vagabond and former criminal. Together the four investigate the crimes, and are drawn deeper and deeper into the plot, where a shadowy underworld figure known only as The Baron calls the shots. The story is thrilling, with theft, murder, secret codes, spies, and plots, all happening at a frantic pace. There’s adventure and peril in abundance, with the richness of the period detail adding to the atmosphere. 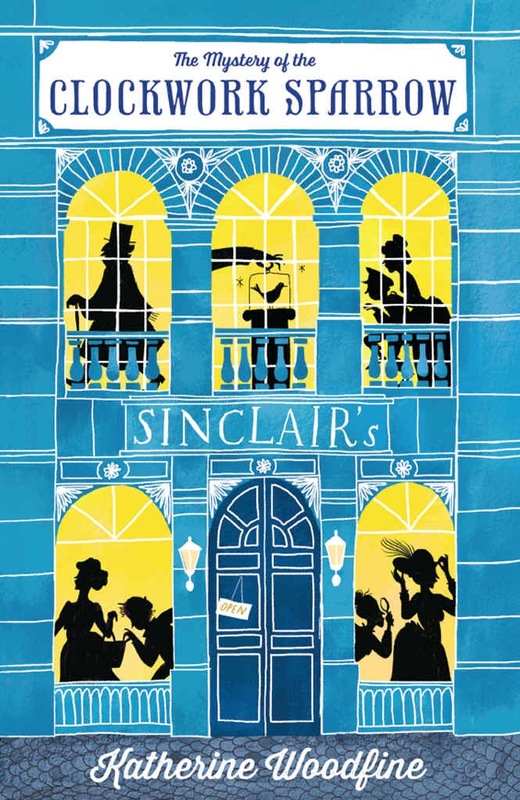 There’s a definite hint of Philip Pullman’s Sally Lockhart books about Clockwork Sparrow, and Sophie Taylor is a great heroine in the same tradition. I’m not entirely convinced by the cryptographic utility of the McGuffin, but that’s a very minor quibble. Spot the problem? Where are Billy and Joe? There are four heroes in this book, and while there’s a definite hierarchy of importance, I don’t think there’s any doubt that it goes Sophie, Billy, Lily, then Joe. For some reason, the publisher has decided to pitch this as a book for girls about girls. Which is utter nonsense. This is a book that anyone would enjoy. That aside, this is a wonderfully exciting adventure, and I’ll look forward to the future adventures of Sophie, Billy, Lily, and Joe.